Fun Facts about Niagara Falls today! In 1969, an earthen dam was built across the head of the American Rapids, dewatering the American Falls. For six months, geologists and engineers studied the rock face and the effects of erosion. It was determined that it would be too costly to remove rock at the base of the American Falls, and that nature should take its course. Niagara Falls are capable of producing over 4 million kilowatts of electricity, which is shared by the United States and Canada. Four of the five Great Lakes drain into the Niagara River, (Superior, Michigan, Huron and Erie) before emptying into Lake Ontario. These five Great Lakes make up almost one-fifth of the world’s fresh water supply. The first person to see and describe Niagara Falls in depth was Father Louis Hennepin, a French priest who accompanied LaSalle on his expedition to the Niagara region in 1678. In 1885, a horse-drawn carriage ride around the falls cost $1 per hour. Did you know that Niagara Falls most famous dare devil was Charles Blondin, who made walks on a tight rope above the Falls? Best time to see it: Sorry, it was made illegal by the City of Niagara Falls to do any more stunts involving Niagara Falls Canada, but Charles Blondin does have a statue over Victoria Avenue near the top of Clifton Hill. Did you know that Niagara Falls is know as the Honeymoon capital of the World? If you honeymoon in Niagara Falls Canada you get a “Honeymoon Certificate signed by the mayor of Niagara Falls. A massive ice block prevented any water from flowing over the falls for almost two days in 1848. 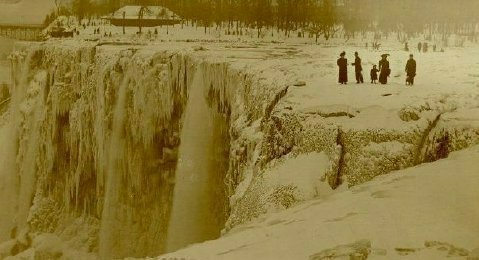 If the temperature gets cold enough in the winter, the river flowing into the falls can freeze creating an ice bridge. Until 1912, visitors were allowed to walk across this bridge. 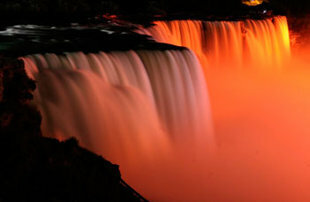 Happy Unofficial Niagara Fall Day at Boca Express Travel!